American lunar orbiter. Lunar lander built by Lockheed Martin for NASA, USA. Launched 1998. Used the LM-100 bus. AKA: LM 100. Status: Operational 1998. First Launch: 1998-01-07. Last Launch: 1998-01-07. Number: 1 . Gross mass: 295 kg (650 lb). Unfuelled mass: 125 kg (275 lb). Height: 1.22 m (4.00 ft). 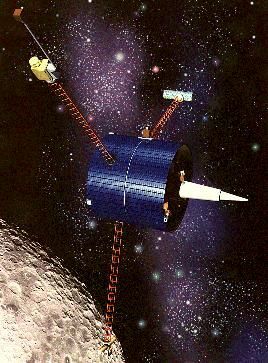 Lunar Prospector was a robotic moon orbiter designed to determine the origin, evolution, and current state of resources of the Moon via low-altitude mapping of its surface composition, magnetic fields, gravity fields, and gas release events. The mission provided a new map that showed in unprecedented detail the chemical composition and the magnetic and gravity fields of the Moon. Lunar Prospector was the third of NASA's Discovery missions. The mission was led by Lockheed and NASA's Ames Research Centre and the entire cost, including launch vehicle, was less than $63M. After launch, the Lunar Prospector had a 105 hour cruise to the Moon, followed by insertion into a near-circular 100 km altitude lunar polar orbit with a period of 118 minutes. The nominal mission duration was one year. A two year extended mission following this was possible, during which the orbit was to be lowered to 50 km and then 10 km altitude to obtain higher resolution measurements. The spacecraft's launch mass was 295 kg (fully fueled), 126 kg (dry). The spacecraft was a graphite-epoxy drum, 1.4 meters in diameter and 1.22 meters high with three 2.5 meter radial instrument booms. It was spin-stabilized and used with Sun and limb sensors for attitude determination. It was controlled by 6 hydrazine monopropellant 22-Newton thrusters providing 1430 m/s of delta-V. . Communications were through two S-band transponders and a slotted, phased-array medium gain antenna and omnidirectional low-gain antenna. There was no on-board computer; ground command was through a 3.6 kbps telemetry link. Body mounted solar cells provided 206 W and recharged 15 amp-hr NiH batteries. Gamma Ray Spectrometer (GRS) - Neutron Spectrometer (NS) - The GRS and NS returned global data on elemental abundances, to be used to help understand the evolution of the lunar highland crust and the duration and extent of basaltic volcanism, and to assess lunar resources. The NS also located significant quantities of water ice which existed in the permanently shadowed areas near the lunar poles. Magnetometer (MAG) - Electron Reflectometer (ER) - The MAG/ER experiments would return data on the lunar crustal magnetic field and the lunar induced magnetic dipole. These data would help provide an understanding of the origin of lunar paleomagnetism and the degree to which impacts could produce paleomagnetism, and allow constraints on the size and composition of the (possible) lunar core. Alpha Particle Spectrometer (APS) - The APS instrument would be used to find radon outgassing events on the lunar surface by detecting alpha particles from the radon gas itself and its decay product, polonium. Observations of the frequency and locations of the gas release events would help characterize one possible source of the tenuous lunar atmosphere. Determination of the relationship of outgassing sites with crater age and tectonic features may be possible. This may in turn be used to characterize the current level of lunar tectonic activity. Doppler Gravity Experiment (DGE) - This investigation would use Doppler tracking of S-Band radio signals to characterize the spacecraft orbit and determine the lunar gravity field. This data would provide information on the lunar interior and, combined with lunar topographic data, would allow modeling of the global crustal asymmetry, crustal structure, and subsurface basin structure. It could also used for planning future lunar missions. The Lunar Prospector was designed for a low polar orbit investigation of the Moon, including mapping of surface composition and possible deposits of polar ice, measurements of magnetic and gravity fields, and study of lunar outgassing events. Data from the 19 month mission will allow construction of a detailed map of the surface composition of the Moon, and will improve our understanding of the origin, evolution, current state, and resources of the Moon. The spacecraft carries 6 experiments: a Gamma Ray Spectrometer (GRS), a Neutron Spectrometer (NS), a Magnetometer (MAG), an Electron Reflectometer (ER), an Alpha Particle Spectrometer (APS), and a Doppler Gravity Experiment (DGE). The instruments are omnidirectional and require no sequencing. The normal observation sequence is to record and downlink data continuously. The spacecraft is a graphite-epoxy drum, 1.37 meters in diameter and 1.28 meters high with three radial 2.5 m instrument booms. A 1.1 m extension boom at the end of one of the 2.5 m booms holds the magnetometer. Total initial mass (fully fueled) was 296 kg. It is spin-stabilized (nominal spin rate 12 rpm) with its spin axis normal to the ecliptic plane. The spacecraft is controlled by 6 hydrazine monopropellant 22-Newton thrusters, two aft, two forward, and two tangential. Three fuel tanks mounted inside the drum hold 138 kg of hydrazine pressurized by helium. The power system consists of body mounted solar cells which produce an average of 186 W and a 4.8 amp-hr rechargeable NiCd battery. Communications are through two S-band transponders, a slotted, phased-array medium gain antenna for downlink, and an omnidirectional low-gain antenna for downlink and uplink. There is no on-board computer, all control is from the ground, commanding a single on-board command and data handling unit. Data are downlinked directly and also stored on a solid-state recorder and downlinked after 53 minutes, to ensure all data collected during communications blackout periods are received. Following launch on 7 January 1998 UT (6 January EST) aboard a three-stage Athena 2 rocket, the Lunar Prospector had a 105 hour cruise to the Moon. During the cruise, the three instrument booms were deployed. The MAG and APS collected calibration data, while the GRS, NS, and ER outgassed for one day, after which they also collected calibration data in cis-lunar space. The craft was inserted into an 11.6-hour period capture orbit about the Moon at the end of the cruise phase. After 24 hours Lunar Prospector was inserted into a 3.5-hour period intermediate orbit, followed 24 hours later (on 13 January 1998) by tranfer into a 92 x 153 km preliminary mapping orbit, and then on 16 January by insertion into the near-circular 100 km altitude nominal lunar polar mapping orbit with an inclination of 90 degrees and a period of 118 minutes. Lunar calibration data was collected during the 11.6- and 3.5-hour orbits. Lunar mapping data collection started shortly after the 118 minute orbit was achieved. The data collection was periodically interrupted during the mission as planned for orbital maintenance burns, which took place to recircularize the orbit whenever the periselene or aposelene was more than 20 to 25 km from the 100 km nominal orbit, about once a month. 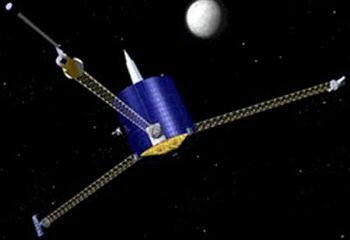 On 19 December 1998, a maneuver lowered the orbit to 40 km to perform higher resolution studies. The orbit was altered again on 28 January to a 15 x 45 km orbit, ending the 1 year primary mission and beginning the extended mission. The mission ended on 31 July 1999 at 9:52:02 UT (5:52:02 EDT) when Lunar Prospector was deliberately targeted to impact in a permanently shadowed area of a crater near the lunar south pole. It was hoped that the impact would liberate water vapor from the suspected ice deposits in the crater and that the plume would be detectable from Earth, however, no plume was observed. The Lunar Prospector mission was the third mission selected by NASA for full development and construction as part of NASA's Discovery Program. Total cost for the mission was $62.8 million including development ($34 million), launch vehicle (~$25 million) and operations (~$4 million). Family: Lunar Orbiters, Moon. Country: USA. Spacecraft: Athena Mars Flyby. Launch Vehicles: Athena-2. Projects: Discovery series. Launch Sites: Cape Canaveral, Cape Canaveral LC46. Agency: NASA, Lockheed. Bibliography: 2, 296, 4, 6663, 12783. 1999 July 31 - . Lunar Prospector, Moon Impact - . Nation: USA. Spacecraft Bus: LM-100. Spacecraft: Lunar Prospector. A two year extended mission following the original one-year mission was possible, during which the orbit was to be lowered to 50 km and then 10 km altitude to obtain higher resolution measurements. However this was not funded, and the spacecraft was commanded to crash into the moon.